I have some specific buildings that I would like to construct out of foam core. I would like to print the buildings first, then glue to foamcore. What programs do you use to mock up the structure? I have corel draw, even thought of using powerpoint. Opinions? But I seem to recall at least one other, so searching around may yield more results. 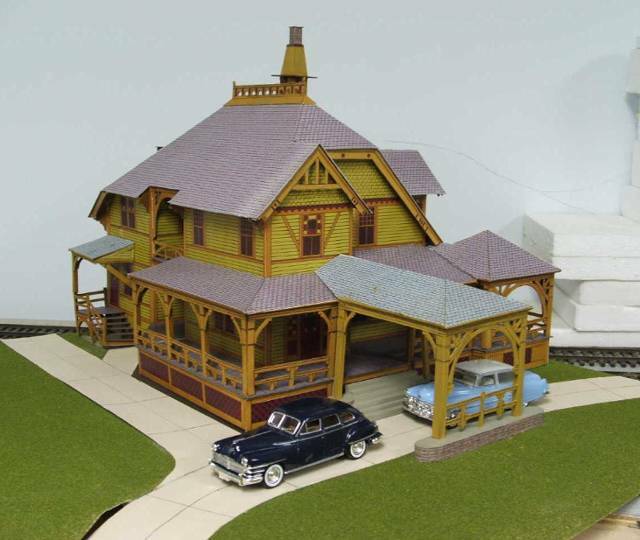 Evans designs sells software just for model buildings. What I want is to replicate local buildings. Example, I have our local bank, I want to put it on our layout. I am not looking to populate with "premade" buildings. How do I replicate local structures? But Roger if you're trying to model existing, specific buildings, that might be very different. I don't know if Evans Designs (or the other ones) will let you import photos of your own local buildings. I rather doubt it, as it would require some real custom-fitting, but it may be worth looking into. You could just take your own photos, and scale them, crop them, clean them up, etc. in something like Photoshop, and just print them out onto paper or full-size sticker sheet to apply onto your own cardstock, matteboard, or other construction. I think you're looking at a true, custom, scratch-buid effort for that. I'm not sure if something like this would do for this topic. It was copied from an HO cut-out booklet for a 'Seaside Victorian Cottage,' which was recopied closer to O scale. It turned out to be more mansion than cottage when done, so I added a porte cochere to the front by recopying some of the parts, elongating and changing them to suit that add-on structure. 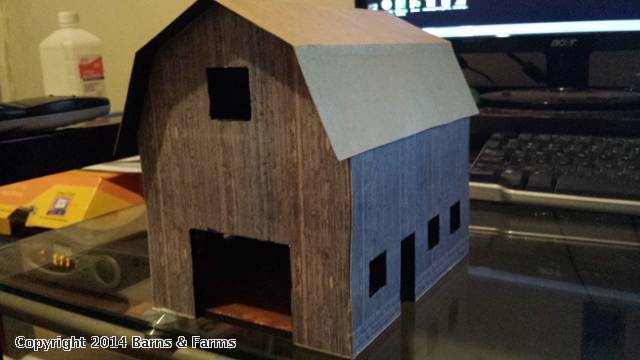 It is entirely made from sheets of index card stock upon which the structure had been printed. 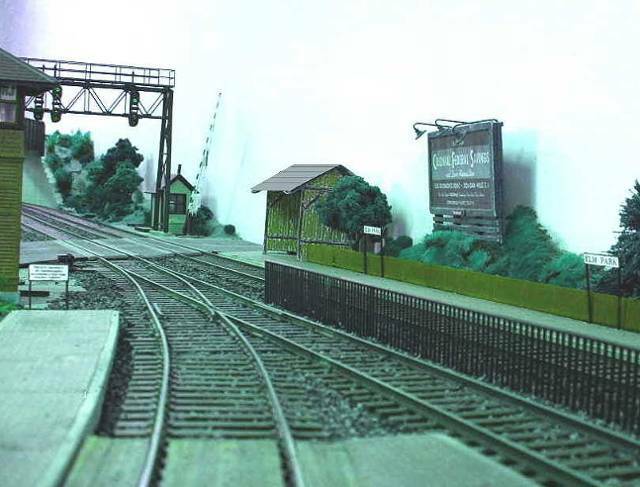 The setting was made for a corner on my Baltimore & New York layout named Tower Hill. The real "Tower Hill" was a mansion similar to this on Staten Island. It was owned by Mrs. Jenny Faber. Her late husband in the 1860s was a co-patentee of the lead pencil. Eberhard-Faber pencils were well known all through 20th Century. While the mansion was torn down in the 1930s and the grounds made into a public park as Mrs. Faber directed in her Will, a small piece of that past was recaptured here. Here is a simpler project than that humongous 'sea side cottage / mansion' I posted earlier. 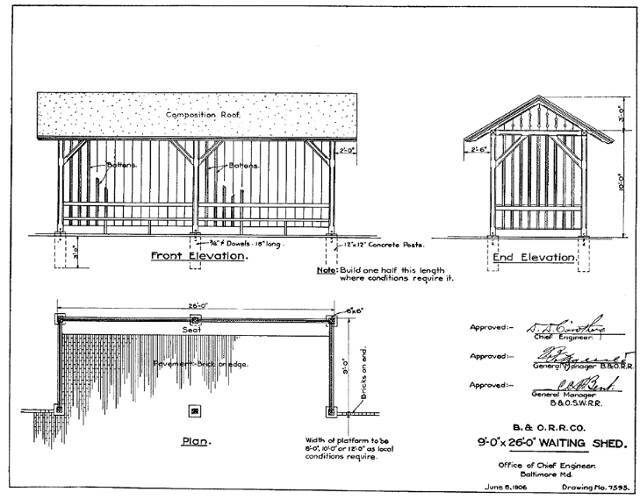 This B&O drawing of 1906 is for a wooden waiting shed, generally used at flag stops along branch lines. Before I would try to make this in styrene or wood, I first make a paper copy from the plans, put it together and then check to see how it fits on the layout. It can also be left in its card stock state as a background structure. This shed is shown with two bays. It can be made shorter or even longer if need be. 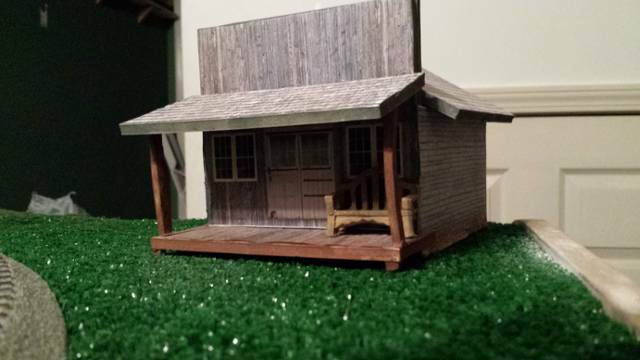 Here is a shot of the card stock mock-up I made of the B&O waiting shelter for my layout. Red with black trim was the B&O official structure colors from the 1920s to the 1940s. The platform is foam core board covered with paper printed with a brick pattern. The shed stands at a main line grade crossing. It serves as an east-bound suburban stop just before reaching the city of Edgewater on the Baltimore & New York. I still need to make a more permanent job of it! I've been using Inkscape and GIMP to create my own card stock model kits for awhile. My new website has a simple tutorial on the basics and I'm planning some videos in the near future. Feel free in chatting me up if anyone is interested in an Inkscape tutorial specifically for O scale modelers.